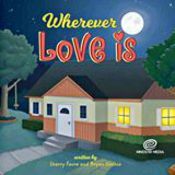 "Wherever Love Is" (Children's Book) - Crosswind Music - book - Bryan's New Book! Please Note: The $12.99 price you'll see when you order the book already includes sales tax, postage, and handling!! This Children's book is based on the story I (Bryan) often tell that led me to write the well known children's song, "Wherever Love Is" about 25 years ago. You can listen to a clip of that simple song on my "Bugs For Lunch!" recording and download that tune here on my site or on i-tunes. When my daughter Emma was about 3 years old she asked me, "Daddy, where is God?" At first I told her that God is everywhere, but I could tell that didn't help her much. I then remembered the verse from 1 John 4 that tells us that "God is love." So I told Emma that since the Bible says that God is Love, then God is wherever love is. A few minutes later she then exclaimed in her ridiculously cute 3 year old voice, "Daddy, God's in me!" And when I said, "You're right--how do you know?" She blurted out, "Because I love you Daddy!" I know...almost too sweet to be true but then again, you've never met my daugther--she's been that sweet since she entered this world and still is all these years later. In fact she now often sings her own kids to sleep with the song based on this story. So that's how "Wherever Love Is" came into being. When I decided to turn this story into a children's book, I contacted my good friend Sherry Favre whom I've known for over 20 years and asked her if she would be interested in writing some children's books with me. Sherry is a gifted youth minister, writer, and all around creative whirlwind and I knew she would be a perfect co-writer for a series of books based on my children's music. This is our first release and we're thrilled to be making this available to all of you! Based on that conversation I had with my daughter all those years ago, this book starts out with a simple exchange at the end of the day between a little girl and her dad in response to her question, "Where is God?" She then asks lots of silly questions about where God might be, and ends up with the wonderful realization that God is inside her because her own heart is full of love for her dad, her mom, her dog, and so many other things. This little book will make a perfect gift for children and parents and grandparents--for anyone with children in their lives whom they want to remind that the best place to find God is "wherever love is." A great gift for a newborn, for the occassion of baptisms, or just for a fun and meaningful bedtime book to help end the day by reminding children that God is with them and within them always in the love that they give and receive. I hope you have lots of fun with "Wherever Love Is" and I'll look forward to hearing from you. And by all means, if you'd like me to write a personalized message in the book and sign it please don't hesitate to contact me and let me know. I'm so excited to be sending this book into the world!